Facebook has launched its first branded sticker pack for messaging and made it free for download. This initial collection is based on the new Universal film Despicable Me 2. 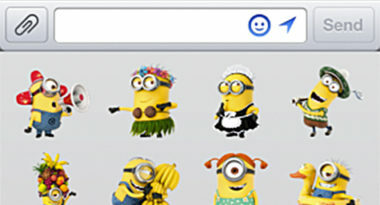 While the studio didn’t have to pay to get them into the sticker store, Facebook may soon be able to generate revenue by charging brands for this viral exposure. TechCrunch.com reported on why free stickers could make Facebook a fortune. Stickers have made major impact on the messaging landscape because they help express emotions that straight text can’t convey. Stickers are fast, fun and unique ways to communicate a wide range of feelings and they let users speak volumes without typing a word. Many startups have made millions of dollars by selling stickers to users. Line already earned $17.6 million in revenue from sticker sales in Q1 2013. Facebook is taking a different approach by making its stickers free while generating revenue through the sale of sponsorship opportunities. Facebook is making all of its sticker packs into free downloads available from a store within the smiley button in Facebook and Messenger for iOS and Android. Facebook realizes that selling sponsorship opportunities may be less lucrative than direct user sales, yet insists that any extra revenue will be a welcome addition. Still, these sponsorship sales could turn Facebook’s enormous messaging traffic into millions. With stickers being naturally viral and extensively shared, brands may be open to paying a per-use or lump-sum fee to get this widespread exposure. This free strategy may also provide a competitive advantage by keeping people on Facebook’s messaging system rather than switching to Google Hangouts, seeking other independent messaging apps, or returning to SMS. The benefit of retaining people on Facebook’s messaging system could greatly outweigh the revenue generated by $1 sticker charges. For Facebook, it looks like a sticker is worth a thousand words and possibly millions of dollars. Discover how social media is evolving with the trends of the times. Contact MDG Advertising today at 561-338-7797 or visit mdgadvertising.com.